Washington's wine country with premier wines is near our Best Western Plus Ahtanum Inn, the perfect destination for wine enthusiasts! Our Yakima hotel is located in a region that gets 300 plus days of sunshine annually, making it the ultimate spot for group events, family fun, and business. A bountiful agricultural region, visitors enjoy the beauty of nature and some of the most delectable local fare imaginable. The Yakima Valley SunDome is just a few blocks away, and the annual Central Washington State Fair draws visitors to the Yakima Valley from around the country. Whether you are here to get away from it all, or for a special event or tournament, allow our staff the privilege of making you feel right at home. Within walking distance of the Regional Valley Mall Shopping Center, our Yakima hotel is designed with convenience in mind. Recently remodeled guest rooms provide a touch of luxury, allowing guests ample amenities and all of the comforts of home. A daily, full hot breakfast buffet is served, and it gives guests the hearty start they need. From freshly made waffles, eggs and meat, to a cereal bar, pastries and yogurts, the meal is completed with fine coffee, and fresh juices. Our outdoor pool and large enclosed grass courtyard area is a favorite for families, large groups and sports tournament teams. WIAA State High School Championship Tournaments also take place in Yakima, and we welcome many golfers to town for our Apple Tree Golf Course Stay & Play Golf Packages, or for the many tournaments that they host annually. Race enthusiasts can enjoy Yakima Speedway, Renegade Raceways, and the State Fair Park Raceway. Yakima is also host to numerous AAU, Sports Forum, Soccer, Softball, and Baseball Tournaments. Business travelers with the Perry Technical Institute, Yakima Valley Community College, PNW University of Health Sciences, and the Yakima Training Center also favor our Yakima hotel for convenience. Driving range - 8.00 mile(s) from Westwood Golf Course, Westwood is a nine hole public course, par 35. The course features a pro shop, cart and club rentals, and a driving range. Miniature golf - 9.00 mile(s) from Meadowbrook Fun Center, this family friendly entertainment complex consists of a miniature golf course, arcade, batting cages, go-karts, and bumper boats. Lake - 20.00 mile(s) from White Water Rafting, Each September, water is released from Rimrock Lake down to the Tieton River, creating class III+ white water rapids. 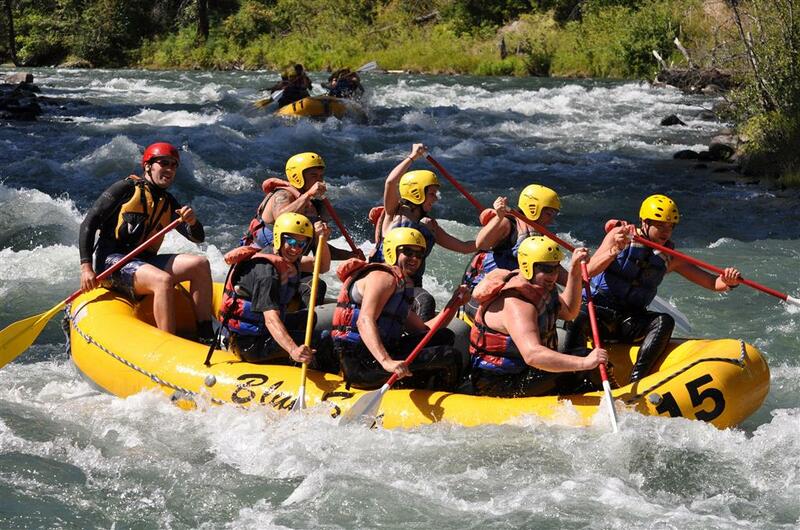 Rafting packages available through the hotel during the month of September. Valley Mall,0.10 mile(s) from Valley Mall, located just across the street, great shopping is within walking distance of our hotel. Shop Macy's, Cabela's Outpost, Sears, Old Navy, Pier One Imports, and more than 80 other specialty stores. Yakima Valley Museum,5.00 mile(s) from Yakima Valley Museum, this local museum explores every aspect of Yakima Valley heritage, from its natural history to American Indian culture to pioneer and early city life to the roots and development of the Valley's fruit industry. Washington Wine Country,5.00 mile(s) from Washington Wine Country, the Yakima Valley is one of the state's oldest and largest wine-growing regions and is currently home to more than 70 wineries. Seasonal wine packages are available through the hotel. Yakima Valley Trolleys,4.00 mile(s) from Yakima Valley Trolleys, experience an authentic early American streetcar ride. The Yakima Valley Trolley is America's last early 20th century interurban electric railroad. Yakima Convention Center,4.00 mile(s) from Yakima Convention Center, conveniently located in downtown Yakima, this facility is home to a variety of conventions and events throughout the year. Toppenish City of Murals,18.00 mile(s) from Toppenish City of Murals, this city of murals boasts over 70 life-size paintings that depict farming, aviation, rodeos, and numerous other historical landscapes. Placards posted near each scene offer historical details. Majestic Movie Theater,0.20 mile(s) from Majestic Movie Theater, one of Yakima s major movie theaters showing blockbuster movies. Larson Art Gallery,4.00 mile(s) from Larson Art Gallery, this local art gallery is located on the campus of Yakima Valley Community College and features a variety of local and regional artists throughout the year. Yakima Arboretum,2.00 mile(s) from Yakima Arboretum, this living museum and botanical garden boasts over 2000 different species of native and exotic trees and plants, including one of the region s few Japanese gardens. Legends Casino,18.00 mile(s) from Legends Casino, central Washington's premier gaming and entertainment destination, Legends Casino offers over 1,200 slots, Vegas style table games, live keno, poker, and a great buffet. Capitol Theater,4.00 mile(s) from Capitol Theater, this historic 1920s vaudeville theatre is home to a variety of performing arts events, including the Yakima Symphony Orchestra, the town hall series, community concerts, and spectacular Broadway touring productions. Allied Arts of Yakima,10.00 mile(s) from Allied Arts of Yakima, Allied Arts of Yakima features a variety of community art shows, theatrical productions, art classes, and other special events throughout the year. Yakima County Stadium,2.00 mile(s) from Yakima County Stadium, this stadium hosts many championship baseball tournaments.